As the chief hardware writer on TechSpot and video reviewer/creator on HUB, I often get asked about my own PC and what I choose to use as my daily driver, so today I’m going to discuss my experiences with AMD's Ryzen Threadripper 1950X and the supporting X399 platform. Since I transitioned over to Threadripper about a year ago and we have 2nd-gen Threadripper landing very shortly, I thought what better time to discuss my experience so far. Prior to the 1950X, my main system was running a Core i7-6950X, Intel’s 2016 flagship high-end desktop CPU packing 10-cores/20-threads and a base frequency of 3 GHz. The 14nm Broadwell-E part came in at.... $1700(!) which was a somewhat absurd price, but as the best of the best, Intel was able to get away with charging an arm and a leg for it. And let me be clear, there are CPUs worthy of commanding such an asking price, but the 6950X carried a 70% premium over the 6900K, but only offered 2 more cores (25% increase), thus absurd. For video editing and encoding the i7-6950X was a beast though, so I hung onto it. A little over a year later the Core i7-7900X landed at a more reasonable $1000 and although it clocked better than the 6950X, the slower Mesh interconnect meant it wasn’t a true upgrade for those alreading on the 6950X. I also knew at the time that AMD would release a 16-core/32-thread Threadripper CPU in August, and a month after that Intel would release an 18-core/36-thread Core i9-7980XE. So after testing the TR 1950X in August I waited a month, gave the i9-7980XE a thorough test, and decided that if I was to invest my money in either it would be without a doubt the Threadripper, so that’s what I did. I bought a retail Threadripper 1950X, MSI X399 Gaming Pro Carbon AC and 64 GB of G.Skill TridentZ DDR4-3200 memory and threw it all together. At the time the 1950X cost half as much as the i9-7980XE and in many workloads was only a fraction slower. That being the case in terms of value the 1950X was the clear winner. In benchmarks its price to performance destroyed the Skylake-X range making a complete mockery of the i9-7980XE and the other 16, 14, 12 and 10-core variants. That said, Threadripper had some issues, as most new platforms tend to, even those from Intel. So let’s talk about the teething problems. 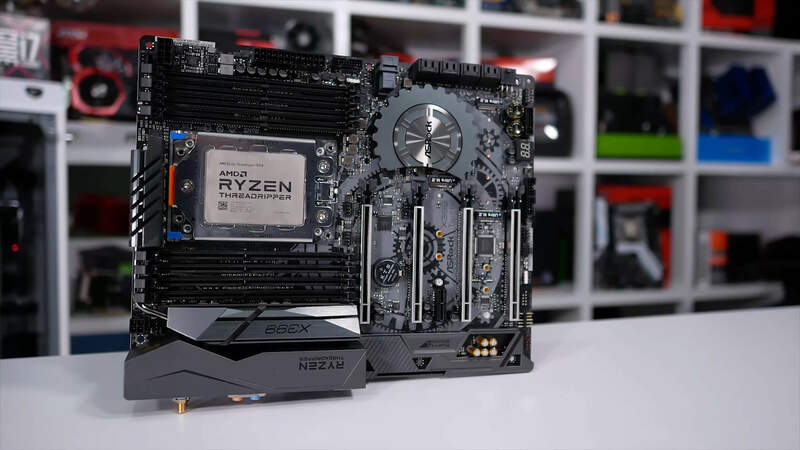 As with all first-gen Ryzen products, Threadripper's biggest issue was memory compatibility and it was a bigger issue on the TR4 socket than it was for the mainstream AM4 socket. Most users building a high-end desktop designed for workstation-type usage will likely populate all available DIMM slots with memory modules, and Ryzen doesn’t like that. Assuming you have compatible memory it will of course work, it just won’t work at the same frequency populating half the DIMMs will. For example, my MSI X399 motherboard packs 8 DIMM slots and with eight 8GB DDR4-3200 modules, that gave me a total memory capacity of 64 GB, and yeah I did at times eat all that up in Premiere when working with our 4K 60fps high bitrate footage. The problem was that with all 8 modules installed the system was limited to a maximum speed of DDR4-2666, and ocassionally I'd ran into boot issues. Most of the time that was not a problem and thankfully MSI's continued support of BIOS updates over the coming months had the boot issues going away. So that teething issue has mostly been solved. Yet to this day I’m stuck at DDR4-2666 if I want to run with all 64GB of memory. That might not sound like a big deal but the system does run noticeably better at DDR4-3200. About 3 months ago I decided to strip out half the memory, reducing the capacity to 32GB. The faster memory speed improved editing performance in Premier, the application was noticeably more responsive and gaming was also better. So that was certainly a compromise but I felt it was worth making. Encoding still takes roughly the same amount of time, but the system was noticeably laggier using programs such as Chrome while Premiere did its thing. From time to time I also game on my main rig and in the first 6 months gaming was a little sketchy. I decided to leave the memory in the UMA or Uniform Memory Access mode as this works best for productivity workloads. However, after a reset it’s possible to switch to the non-uniform memory access or NUMA mode and this works best for gaming. Still as this is mostly a workstation PC I didn’t want to be messing around with memory access modes every time I decided to casually fire up a game for a few rounds. Unfortunately I don’t know exactly what improved things on the gaming front for me, but about 6 months into my Threadripper journey things did get a lot better. I can't tell for sure if it was one of the major Windows updates or a BIOS update, but I stopped seeing a random glitches. Star Wars Battlefront II, for example, was taking what felt like an hour to load, it was literally minutes to load just the main menu and took 4 times longer than that of a Core i3-8100. Then once in the menu it took a few minutes to load into a game, I was always the last one to the party despite rocking a premium NVMe SSD. Not all games had issues and to be fair most worked fine, but there were some that were a bit quirky with Threadripper. Today I’m no longer seeing any of those problems and I’m always on the lookout for new BIOS updates. Beyond the memory woes and the minor early problems with some games, it’s been smooth sailing. As a side note, I should just add that Intel’s X299 platform had its fair share of quirks as well, just as the X99 platform before it, so none of this is particularly unusual. For everything else though, Threadripper delivered, it really has. Having 16 cores and 32 threads to play with is amazing and something only we could have dreamt of prior to its release. As said before, in 2016 10 cores cost $1700, then in 2017 in the face of competition we got a 10-core CPU from Intel for $1000, whoopie. By the end of 2017 AMD were selling the 16-core TR 1950X for under $1000, today it’s on Amazon for $775 while the 7900X still costs nearly $1000. So, I’ve spent almost a year with Threadripper and I don’t regret the decision to go with it over the Core i9-7980XE one bit, and unless Intel comes out with something far more compelling than they’re currently offering, I won’t be jumping back anytime soon. In fact, I’ll almost certainly be doubling down and upgrading to the Threadripper 2990WX on MSI's X399 Creation motherboard. Back to the previous generation for a moment, had Intel been far more aggressive with pricing it might have been a tough call to make. But certainly, for half the price the 1950X was an obvious choice over the 7980XE, and today it should be crystal clear, even for the most blue eyed of fans. Come next week I expect things to get seriously messy for Intel as AMD pushes Threadripper 2 out the door. We learned during Computex about AMD's plan for a 32-core/64-thread Threadripper on the TR4 socket, and we just learnt that it will cost less than Intel’s 18-core 7980XE, coming in at $1799 (you can pre-order now). So assuming everything goes smoothly -- we expect so -- it’s very likely my workstation is going to see a doubling of cores in the very near future and fingers crossed, improved memory support. Look out for our Ryzen Threadripper 2990WX review soon.